An alarm clock radio can have many uses in your home. Most importantly, a reliable alarm clock will ensure that you get up on time for work, school, and other activities. 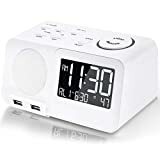 An alarm clock radio can also be used as a radio when you’re looking for an easy way to listen to local radio stations. 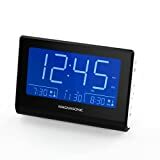 There are many different types of alarm clock radios. They come in many colors and designs so that you can find one that fits in with your home decor. 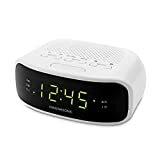 It can be helpful to find an alarm clock radio that plugs into an electric outlet and also has a backup battery so that you don’t have to worry about missing your alarm in case of a power outage. 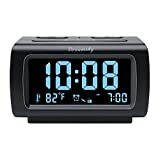 When choosing an alarm clock radio, you want to find one that has an alarm sound that will wake you up when you need. A dependable alarm clock will ensure that you don’t miss important appointments or other events. Many alarm clock radios will have a snooze feature that allows you to sleep for a few more minutes when you push the button. 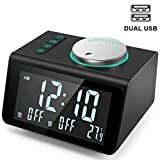 Since an alarm clock may last an eternity (20-30 years is not unheard of), it might be good to consider how certain features will impact its usage. Read below for some information and questions that might come up. The old guideline of 8 hours of sleep is still considered best by most sleep researchers. Adults should get 7-9 hours of quality sleep each night with those over 65 need an hour or two less. Notice the term ‘quality’ sleep which is very different than hours in bed. Also, the number of hours does not always need to be continuous. Naps are good tools to make up for a restless night. 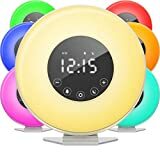 What Color Alarm Clock is Best for Sleep? While this is not about the decor of your bedroom or the looks of the clock itself, the color mentioned here refers to the display. Most alarm clocks now come with a dimmer switch that can turn down the brightness level of the display. Some people can be very sensitive to the amount of light in a room. Computers, cell phones, and yes, alarm clocks that give off blue light tend to disrupt sleep more than those of other colors. 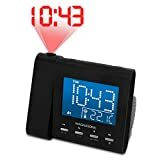 How to Wake up to an Alarm if you are a Deep Sleeper? There are several specialty clocks which can be used to wake a sound sleeper. 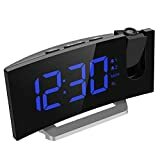 If you do not want to go so far as to purchase a bed shaking, lights flashing alarm clock, there are a few less drastic measures that you might try. 2. Use the radio as your alarm and turn it all the way up. 4. Move your alarm so that you must get out of bed to hit the snooze button. What is your Biological Sleep Clock? Perhaps better referred to as an ‘internal clock’ so that one does not confuse this issue with women of childbearing age, each individual tends to have an internal clock that makes it easier to sleep at certain times during the day. Disrupting this cycle or routine can make it difficult to fall asleep, stay asleep or even wake up. Often, this internal rhythm is described in terms of being a ‘morning person’ or ‘night owl’. Nowadays, the corded electric appliance has become so commonplace, most manufacturers do not even mention it in the description. But do some homework before purchasing to make sure the choice is best for the situation. In addition to corded electric, there are battery operated and manual (windup) models. 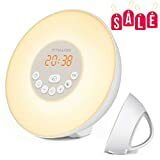 The concept of the alarm clock has not changed much over the last 50 or 60 years but the increase in features – such as dimmer switches and sleep sounds – has made navigating these choices something of a maze. Units that have simple buttons and quick setup will promote that in their literature. As much as one might want all the bells and whistles of an advanced model, if the directions are difficult to understand, these features may go unused. Better to get a model that is user-friendly than one that leads to frustration. How long will my Battery Operated Clock run Before I need to Change the Batteries? For units powered by standard 120v electricity, the length of a cord may be important. Some cords are as short as 4 ft but most fall between 5 and 7 ft. If the outlets are placed well away from the bed, it might be necessary to put the clock on an adjacent wall. Remember never use an extension cord under the bed or around bedclothes. Warranties and return policies vary greatly with these products. Check manufacturer’s information to see what if any warranty is offered. Levi Hutchinson of New Hampshire reportedly invented the first alarm clock in 1787. The clock only went off at 4 am as it was designed for farmers. Interestingly, Levi was murdered by his wife one cold New England morning at a reported time of 4:05 am.